Based on the hit 2001 DreamWorks animation of the same name, Shrek the Musical is a truly magical fairytale from start to finish. As the page turns on the book to begin the show, the entire audience is transported back to being a small child again eager to hear the story being told. Unapologetically true to the source material this has had an injection of musical theatre magic. This production is outstanding with amazing effects, lighting and costumes that are designed to showcase these larger than life characters as they are meant to be seen. The ensemble perform with such precision and chemistry between the cast bringing energy and panache to every number. Particular highlights include Samuel Holmes' exquisite portrayal of Lord Farquhaad. He brings both passion and humour in his key numbers What’s up, Duloc? and The Ballad of Farquaad. Marcus Ayton nails Donkey's cheeky character creating a perfect comic foil and his performance of Don't let me go brought true heart to the part. The Dragon played by Jen Tierney voice was so powerful and soulful and again a massive highlight. Given the source material, there is always a risk of it becoming too pantomime-esque than a musical however the cast expertly take the audience on this magical journey. This show for all ages has so much humour and fun that whatever your age you're sure to leave with a smile. 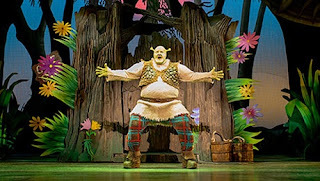 Shrek the Musical is at the King's Theatre Glasgow until Saturday 6th October. Captioned, Audio described and signed performances are available. For tickets visit ATG Tickets.